Forget you have a birthday coming up? No, not your own, though you are definitely a part of the celebrations! July 1 st, 2017 is Canada’s 150th birthday and we have to say, the country is looking fantastic. Numerous celebrations are happening from coast to coast and there will be opportunities for fun in your community. Many Canadians are planning their own festivities too! Do you want to be a part of the fun, but are not sure what you can do? Here are some suggestions on how you can celebrate this important day without spending too much money. Many Canadians think we mostly just “eat American.” While there is some truth to this, Canada has a lot of its own wonderful foods and this is the perfect time to make some of your favourites. Whether you want an appetizer, a main course, or some delicious dessert, our country has produced countless wonderful foods. Now is your chance to catch up with some old favourites or even try some new ones. Here is an article we wrote on Canadian cuisine for Canada 150 that includes links to recipes and a bit of history about each dish. For the 19+ folks at the gettogether, consider having Canadian adult beverages on hand like Moosehead Beer or Newfoundland Screech Rum. It isn’t a party without decorations, but why buy them when you can create terrific ones for Canada 150? Enjoy arts and crafts? Anything with a red and white motif is perfect and if you can incorporate the flag in there somewhere, even better! Not sure which way you want to go? 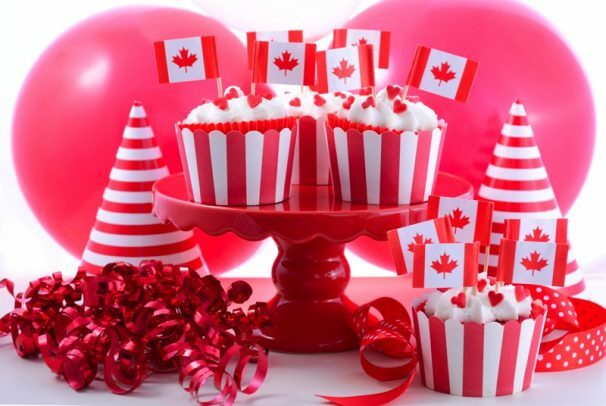 Draw inspiration from these amazing Canada Day-themed decorations. Here’s another way to for creative people to get into the spirit of the celebration: create Canada 150-themed art projects. These can be anything to do with our country, its heritage, its future, what you love about it now, our indigenous people, food, animals…you name it! Draw, paint, sculpt, or even create art using your computer. The only prerequisite is it should somehow be about our country. People of all ages and skill levels should take part. Have a night of your favourite Canadian movies you have been meaning to watch or have a second look at ones you loved. Watch one of the classics like GOIN’ DOWN THE ROAD or MON ONCLE ANTOINE, or perhaps a contemporary favourite like BON COP, BAD COP or TRAILER PARK BOYS: THE MOVIE. How about a look at indigenous culture like ATANARJUAT: THE FAST RUNNER or maybe the quintessentially Canadian comedy STRANGE BREW with Dave Thomas & Rick Moranis as the McKenzie Brothers? There is a lot to choose from and most of them are an enjoyable reminder that Hollywood does have the monopoly on quality cinema. Want a more comprehensive list? Try here. Leonard Cohen. Gordon Lightfoot. Celine Dion. The Guess Who. Neil Young. Bryan Adams. Rush. Anne Murray. kd lang. Sarah McLachlan. Bare Naked Ladies. Bruce Cockburn. Michael Bublé. Burton Cummings. Blue Rodeo. Glenn Gould. Ronnie Hawkins. Alanis Morissette. Buffy Sainte-Marie. Nelly Furtado. The Tragically Hip. There’s so much great music to choose from for your celebration! This list hardly even scratches the surface.